Once upon a time, Seattle’s premier department store was Frederick and Nelsons. Located in downtown Seattle, this store opened its door in 1890 “selling used furniture during the rebuilding of Seattle after the Great Fire of 1889.” Over the years, the store expanded adding a tea room, and departments such as clothing, shoes, linens, jewelry and cosmetics. In 1992, shopping patterns had changed with the advent of suburban shopping malls, discount stores and specialty stores. Frederick and Nelson’s shut their doors and filed for bankruptcy. Of all the salads, desserts, soups and entrees I’d made over the years, how did this simple shrimp salad rise to the top of the list? Thirty-year old memories filled my mind – Frederick and Nelson’s tea room, the salad and how I tinkered with this recipe until it was as good as the one offered on their menu. Back then, I had no idea that “my shrimp salad” would turn out to be my signature dish when Thanksgiving came around. 1. Add all ingredients in a large bowl. Using a large spoon or spatula, gently fold ingredients together until well blended. 2. Keep chilled in refrigerator until serving. NOTE: Consider this recipe a blue print. If you love celery, add more. Sometimes I add fresh crab meat or increase the amount of shrimp in the salad. Vary the proportion of ingredients to suit your taste. Experimenting with new foods and flavors fascinates me. Recently, in a discussion about quince, my friend Jan Schwert mentioned that when she was traveling in Spain, she discovered quince paste. “This paste is served on crackers with cheese at nearly every meal,” she said. I wanted a taste of this quince paste and I wanted to know more about it. After discovering the Spanish word for quince is membrillo, I stopped at my neighborhood grocery store. Not sure if they had it, I first looked near the jams and jellies. Not finding it there, I went to the cheese section. A small container was labeled Homemade Membrillo. Suggestions for serving read: “Pairs harmoniously with cheese; excellent as a dessert. Ingredients include quince paste, sugar and lemon. Membrillo, a type of fruit cheese, is wine-colored, and can be sliced or cubed. If you have quince and a couple of hours you can make membrillo at home. Click here for a recipe and easy-to-follow directions. I decided to buy my membrilo. Sometimes, this type of paste is called fruit cheese. Fruit cheese – made with apples, pears, plums or quince – is a deeply concentrated fruit paste that can be cut into cubes or slices. Fruit cheese, frequently served on a cheese plate, adds sweetness and flavor. The Spanish like to serve Manchego cheese with membrillo. In fact the pairing is often referred to as Romeo y Juliet because just like these lovers, manchego and membrillo were meant for each other. Manchego, sheep’s milk cheese, is hard with a herringbone pattern on its inedible rind. Manchego comes from La Mancha, Spain’s largest wine region and the home of Don Quixote. Aged for 3, 6 or 12 months, Manchego tastes mild and salty; its texture is creamy and its color is light, nearly white. Manchego has a higher fat content than cheese made from cow’s or goat ‘s milk. When heated, the cheese becomes soft and gooey. With the two main ingredients in hand, I was ready for tasting. I spread membrillo on a cracker, added a slice of manchego and popped it into my mouth. The taste intrigued me; the membrillo added a fruity, slightly sweet taste complementing the salty, nutty taste of the cheese. I wondered how it would taste if I put the cheese on a cracker and zapped it for 10 seconds in the microwave to melt the cheese, then the membrillo. Yes, this was divine. Still curious to discover more ways to use membrillo, I searched the internet and found a video showing how to make membrillo and manchego quesadillas. I discovered a cookbook, The Spanish Table, offering more recipes. This recipe, quick and easy, makes an interesting and tasty appetizer. My husband and I made a large green salad to accompany our quesadillas for a light Sunday supper. My adventures with food and flavors seem to be endless. I wonder how membrillo and cream cheese with a pinch of lavender might taste spread on toast. That will have to wait for another day. Now I want to hear from you. Have you tried membrillo? What is your favorite way to serve it? Please share your food and flavor adventures. 1. Place tortilla in skillet over high heat for about 10 seconds. 2. Drizzle olive oil over tortilla. Flip tortilla over. 3. Place grated cheese on top of the tortilla. 4. Place cubes of membrillo on top of cheese. 5. When cheese begins to melt, fold tortilla over itself. Continue to cook for about 1 minute until cheese is melted. Remove from pan and place on cutting board. Cut into wedges and serve. Yesterday, I spent the afternoon making quince jelly. This is a perfect example of how one thing often leads to another. After poaching quince for my quince tatin, I saved the remaining poaching liquid. David Lebovitz described how he turned his left-over poaching liquid into quince jelly. Since quince jelly holds first place in my list of nostalgic memories, I decided to give it a try. My Grandma Grace’s quince jelly sparkled like an amber jewel and tasted sweet and fruity. I brought the poaching liquid to a boil, clipped a candy thermometer on the side of my pot. The temperature slowly rose to 225 F. I stirred it with a silicon spatula; it looked thin, more like water that syrup. So I continued to let it simmer for another 10 minutes. Meanwhile, I sterilized the small jars and lids so they would be ready when the jelly set up. The temperature seemed stuck at 225 F. Would this be jelly or syrup? It did not seem to be setting up. I poured the hot liquid into the jars hoping for the best. After several hours, I dipped a spoon into the quince jelly. It was still liquid. I was disappointed and perplexed, “what had gone wrong?” I asked. My quince jelly was lovely, amber with dark speckles of the vanilla. Only problem was it was not jelly, it was a thin syrup-like substance, too thick even to be described as runny jelly. Getting a little tired of this entire episode, I emptied each jar back into a saucepan and turned the heat on high. I boiled it for another 20 minutes on high heat. Once more, I washed the jelly jars and sterilized the jars and lids. Finally, I poured the jelly into the jars. Earlier I had four jars of jelly, after prolonged cooking, I ended up with two jars of the most beautiful quince jelly I’ve ever seen or tasted with just one exception. You guessed it; Grandma Grace still takes the blue ribbon. Tart Tatin is one of my favorite desserts. Apple Tart Tatin brings back memories of my grandmother’s apple pies. The apples are soft, sweet and the buttery pastry is delicate and delicious. I’ve also made Pear Tart Tatin. So when I came across David Lebovitz’s recipe for Quince Tart Tatin, I was eager to give it a try. I began by poaching the quince until it was soft and tender. The poaching liquid consisted of water, sugar, honey, lemon and vanilla. These little quinces were dry and tough. I simmered them for about an hour before a paring knife slid through without resistance. While the quince soaked up sweetness and flavoring, I mixed up the pastry for the Tart Tatin. David’s pastry recipe is the easiest I’ve encountered. Flour, sugar, salt and butter were “blitzed” together in my food processor. Then I added a little ice water, and just that fast, I had my pastry dough ready to go. I wrapped it in plastic wrap and put it in the refrigerator to cool. In most Tart Tatin recipes, the fruit is partially cooked on the top of the stove in a mixture of sugar and butter. Once the fruit is soft, the crust goes on top and the whole thing goes into the oven. After it is cooked, the Tart Tatin is inverted on a cake plate. The result is a beautiful dessert, with caramelized fruit sitting on top of a butter crust. For the Quince Tart Tatin, the poaching liquid is cooked in an oven-proof skillet until it is thick syrup. The poached quince is placed in top of the syrup, and then the pastry crust goes over the quince. Into the oven at 375F, 45 minutes later, drum roll! Quince Tart Tatin is ready. Serve with a scoop of vanilla ice cream. Quince, once considered a symbol of love, has been around for more than 4000 years. This fruit, yellow-skinned, tastes like a cross between an apple and a pear. Quince belongs to the rose family. This fruit won’t win any beauty pageants. Its shape is irregular, its skin is often blemished and its texture is hard and dry. When quince is poached in wine and sweetened with sugar or honey, the fruit is transformed into a beauty queen. The fruit takes on a vibrant red color, and tastes exotic. The recipe I used was created by Debra Daniels Zeller. I made one modification. I used lavender sugar. Debra’s recipe was recently published on her blog, Food Connections. The quince soaked up the raspberry wine and filled by kitchen with an unforgettable fragrance. When the fruit was tender and the liquid turned into a rich syrup, I knew it was time to scoop the ice cream. A perfect dessert for a stormy Seattle evening. I still have six more quince. So tomorrow, I am baking a quince tatin based on a recipe posted by David Lebovitz. 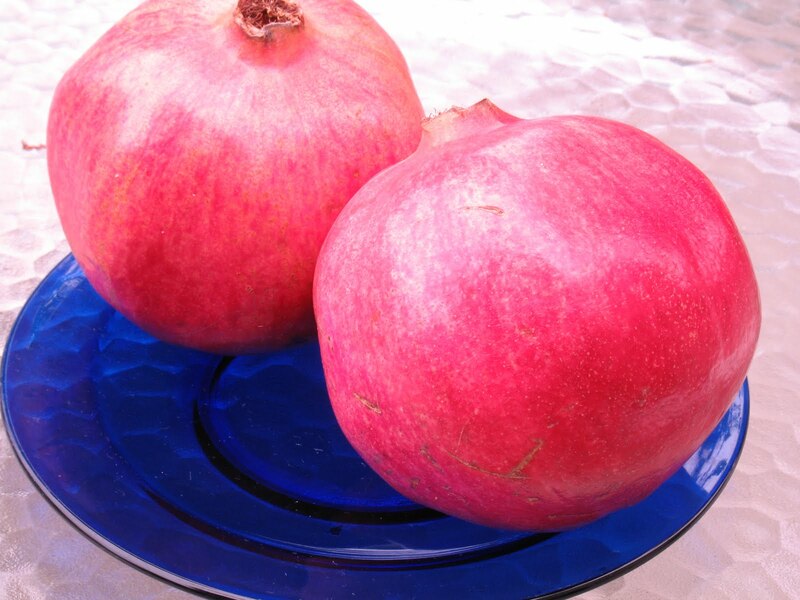 Pomegranates, originated in the arid regions of the Mediterranean, grow on shrubby trees. This fruit with its red leathery rind is full of ruby-colored seeds. The edible seeds are both tangy and sweet. On a recent visit to southern California, I spent a day at the Getty Villa in Malibu. The Getty Villa, modeled after a Roman country house, shows off the lifestyle of this time. Love for symmetry, nature and beauty is evident in the gardens, the architectural details and the sculpture. Walking through the herb garden, we first noticed the symmetrical plantings of lavender, thyme, mint and rosemary. Olive trees lined the length of the courtyard. 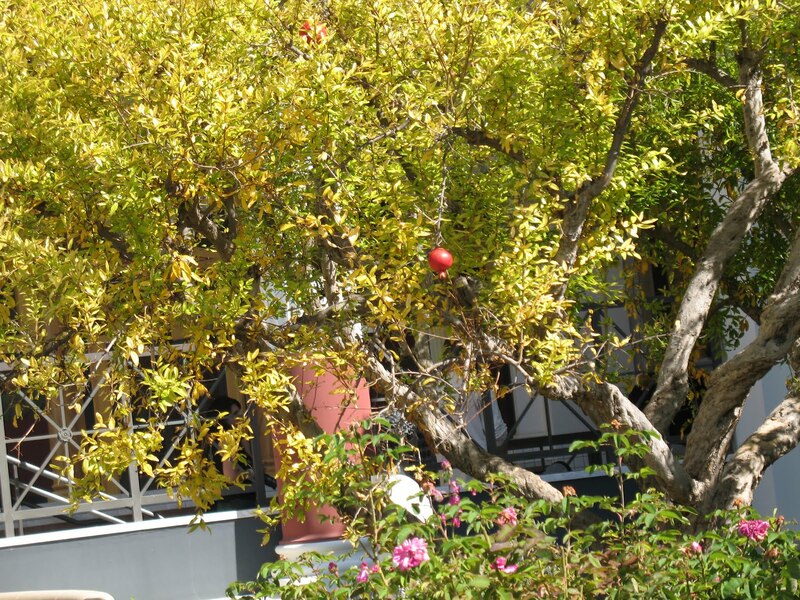 A single bright red pomegranate hung from a leafy tree. 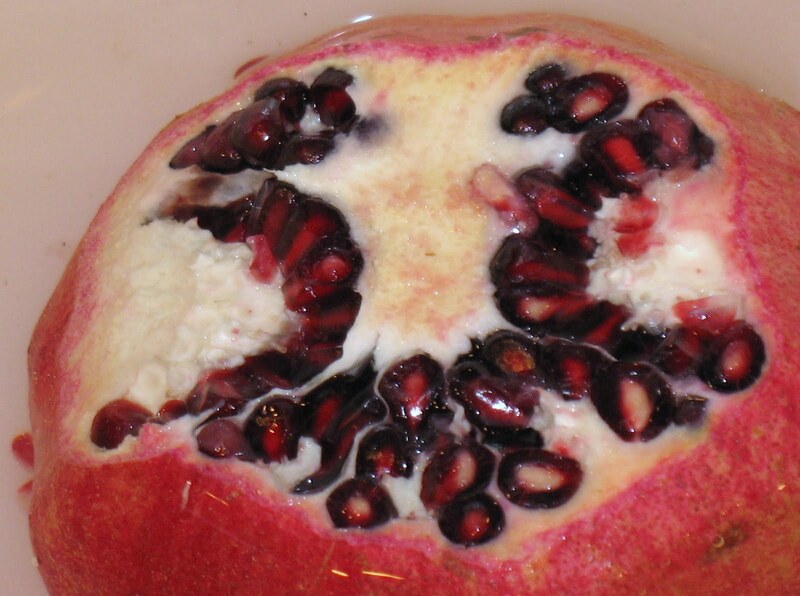 Later, back in Seattle, I bought a couple of pomegranates at the grocery store. I cut the fruit open, and looked at the glistening jewel-like seeds. I tasted one and loved the tangy taste and the slightly crunchy flavor. One pomegranate gave me about 2 cups of seeds. I decided to make some pomegranate syrup. The pomegranate seeds went into my blender and after about 1 minute on high, they had turned into bright red juice. I strained the juice through cheesecloth to remove any grit remaining from the seeds. I added the juice to a small sauce pan stirred in 1/4 cup of sugar and brought the mixture to a boil for about 5 minutes. After letting the syrup cool, I put it in a jar and stored it in the refrigerator. 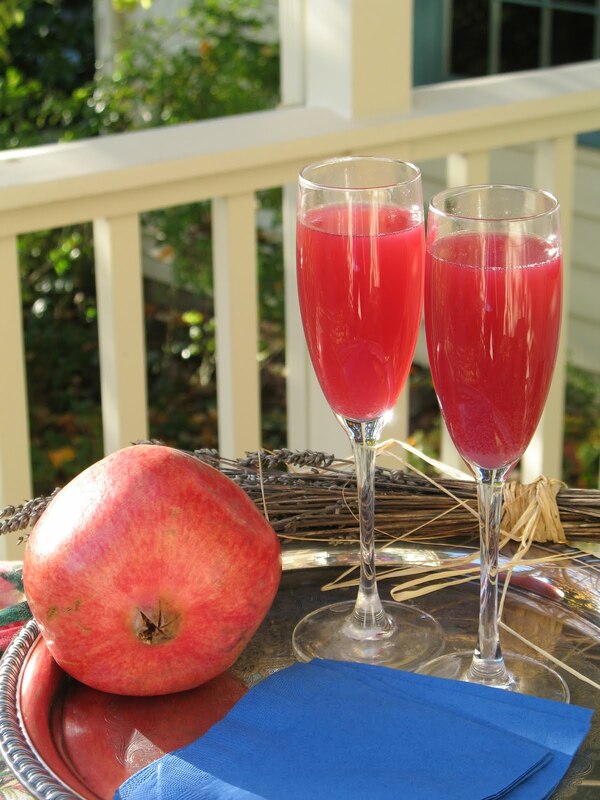 To celebrate pomegranates, I decided to create a Champagne Cocktail flavored with pomegranate syrup. Piquant and perfect, this festive drink is dedicated to the Romans and their beautiful country homes.